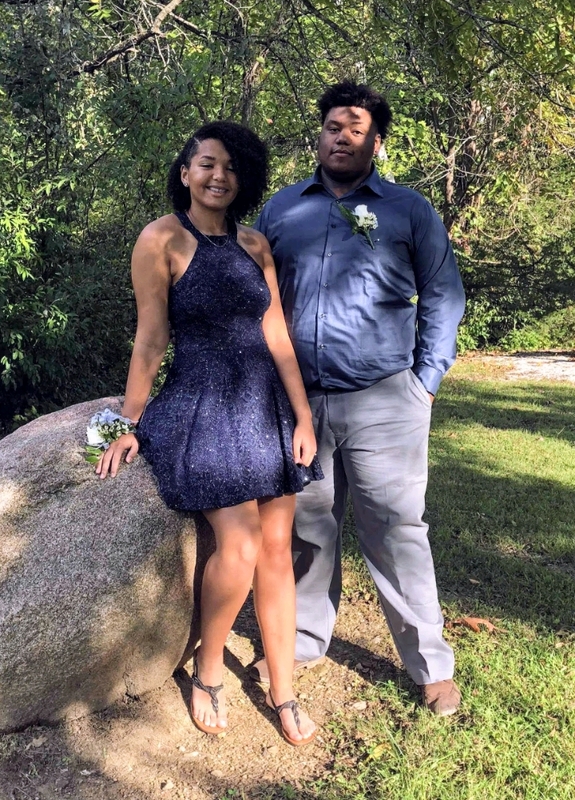 Apparently the Homecoming Dance wasn't very exciting since Anah and J left early and went to his house. Much ado about nothing it seems. The build up is what's important, buying the dress, taking pictures, painted toenails etc. So it seems to me. I, personally, never attended Homecoming when I was in high school, so have no basis for comparison. Anah, of course, looked lovely to me. I walked over to see the preparations and Erin grabbed a photo of us together. J was looking dapper as well and they are just soo cute together. Sunday they tore down the float. Not a prizewinner this year so everyone was disappointed. 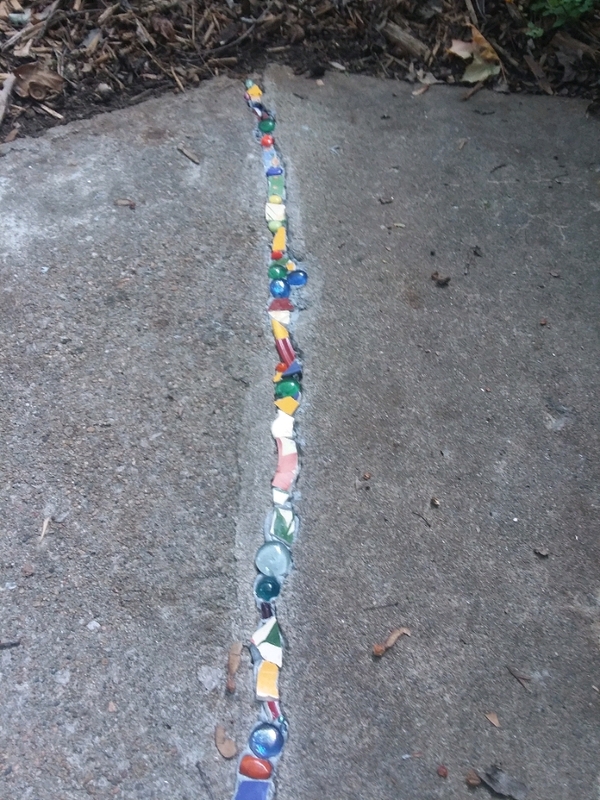 Have worked on the sidewalk mosaic the last couple of mornings and I just can't get a great picture of it, but will offer up the crummy ones just to show I am making progress and have started on a second crack. Currently finishing up a P.D. James mystery, "An Unsuitable Job for a Woman." Not sure how I missed this one, but I did. I am embarrassed at the number of books I have recently acquired. I keep reading these lists and reviews and then adding the books to my "to read" stack. I am going to need another bookcase soon. Went to knitting club yesterday morning, but still am not finding it to be a good fit for me. Might try again next week. I keep reading that social interaction is important in old age. While working on my current project (the lace sock) I was talking instead of paying attention and so came home and had to frog a number of rows. Yuck. If I go again will take a simple project that requires no thought. With the husband's worthy assistance finished up whacking back the brush from the fence on the east side of the house. Not enough sun could get through and the lilacs were suffering. I've been sore since doing all that work, but not too bad. Most of the garden is now done, but I picked a couple of gallons of green beans yesterday. We really need rain again and am hopeful that Thursday's 80% chance becomes a reality. Continuing to dig through records and add to the family tree and have made contact with some distant cousins through the DNA testing. Thanks to fauxklore for suggesting uploading the raw DNA to a couple of free sites to see if I can make more connections. Countdown to a trip to The Elms....10 days. I do love those spa vacations! I haven't dug out my Halloween decorations. I really haven't thought I wanted to do so. How unusual. Halloween has long been my favorite holiday. Like so much else am I leaving it behind? Just seems like too much work, but could maybe make myself get out my favorite witch, decorate the bay window? I bought this 50 cent plant stake for inspiration. looks like a great prom. its so nice and warm where you are! Gosh it's already cold there, I'm not ready for that. There is probably a place you could put a mosaic, a crack of some kind? Anah is such a doll. At least she can say she went to her Prom. I didn't have any desire to go to mine. It just wasn't an interest to me back then. The 2 pictures of her show such a nice looking area you guys live in. What a great idea for your sidewalk cracks. I love the way it's shaping up. Maybe when it's a little closer to Halloween you will get in the mood. Thanks, I think she is a real cutie, and she is my favorite. We live in the country and it is nice out here. Talked to Anah yesterday and she wants to decorate so if she shows up, we'll do it! Just need an enthusiastic helper. Aw thanks, girl...made my day ! Sounds lovely keep you've been busy and happy! I love all the picts you shared! I hope the knitting group feels better for you next time <3 I need something like that in my life. The cracks are looking great! I really liked Anah's dress. Blue is my favorite color. I didn't do anything extracurricular in high school, but I did make good grades. I'll give knitting club another try maybe. My life and way of thinking is so different from the othrr women, I feel like an alien. I am loving the cracks, but ran out of the filler so guess I 'll have to go to town today. That being said, I'm still glad you're going to give it another try <3 I've had to seriously lower my expectations around certain people (like the spouse of a good friend so you HAVE to see them, you know? It's so frustrating but I gotta do it out of respect...) and once I do that, it makes it a bit easier. I find it interesting that short dresses are back in since I come from the era of the mini-skirt, but I like them, and you are right about the dancing. Our fave colors are a match till it comes to pink. I never wear pink. I remember seeing a British TV adaptation of that P. D. James novel on PBS going on twenty years ago. I don't remember if it was good or not, though. I don't recall it ever being rerun, so maybe it wasn't: IMDb. I'll have to check that out. Like you I do enjoy Brits killing each other off. What excellent photos. Anah does indeed look stunning. And your mosaic is such a glorious splash of colour in the drab pavement. My daughter took the pics, the lighting was great that day. Found a new plate to smash yesterday so have new colors to add - excited. Ah, ha! I spy an aloe vera! I don't do much for Christmas these days. I've got advice for your sidewalk cracks: Look out, Rosegardenfae is coming! I would find it hard to knit and talk, too. And I hope that spa can sooth away any sore muscles! 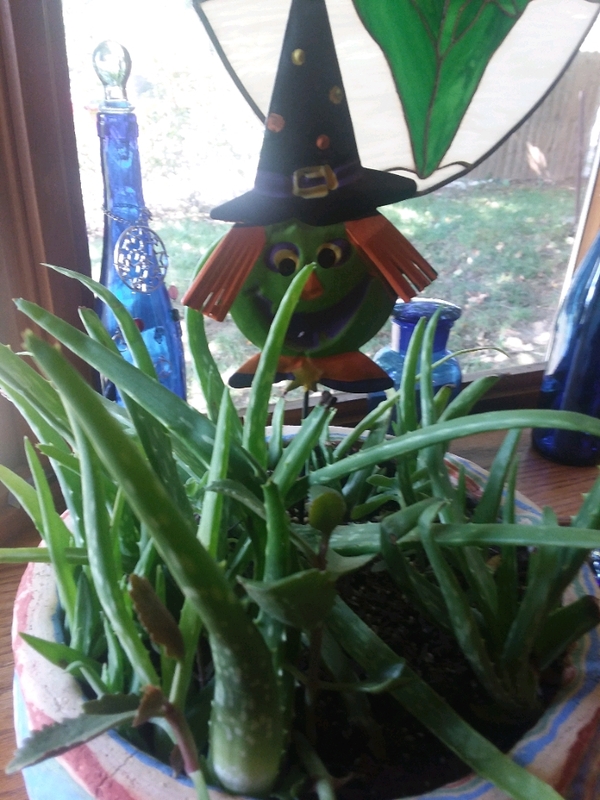 We have lots of aloe, most at daughters house, but I kept one pot, a must have for burns. Sure hoping they aren't getting up to much lol. She is a good kid and very honest and open with her mom. Fingers crossed. Thanks for the good spa vibes. Plan to do some major resting and hottub time. Always good to have an aloe plant or two about. That's good that Anah is honest. 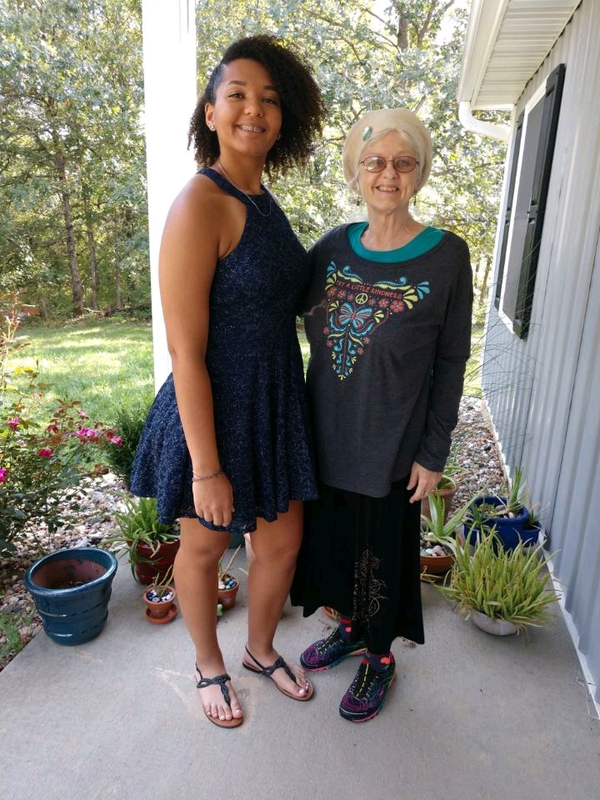 It's hard seeing our children and grandchildren growing up! And yeah for spa time! "I am going to need another bookcase soon." I've built dozens of bookcases for the houses I've lived in and for the pre-school chain I once worked for. Then, I actually bought one for the house that I'm now living in and that seems to have been a "watershed moment" in my life. When that one was filled, I just started stacking the new ones I'd read on the corner nearest my chair. Now, as I contempate the sedate passage of these sunset years--perhaps yearning a bit for the bizarre and exciting things we experienced when we were younger--I've decided that my ideal passage from this life would be for it to end in a massive cascade of falling books. Re: knitting groups, mine suits me well. But I do not bring projects that require concentration. There is social knitting and there is home knitting and never the twain shall meet. She meets Dalgliesh at the end of Unsuitable... Now I am thinking that perhaps I have only read the Inspector Dalgliesh series. But, I am unsure because it has been so long ago. Oh well, must get through my present stack before going back.